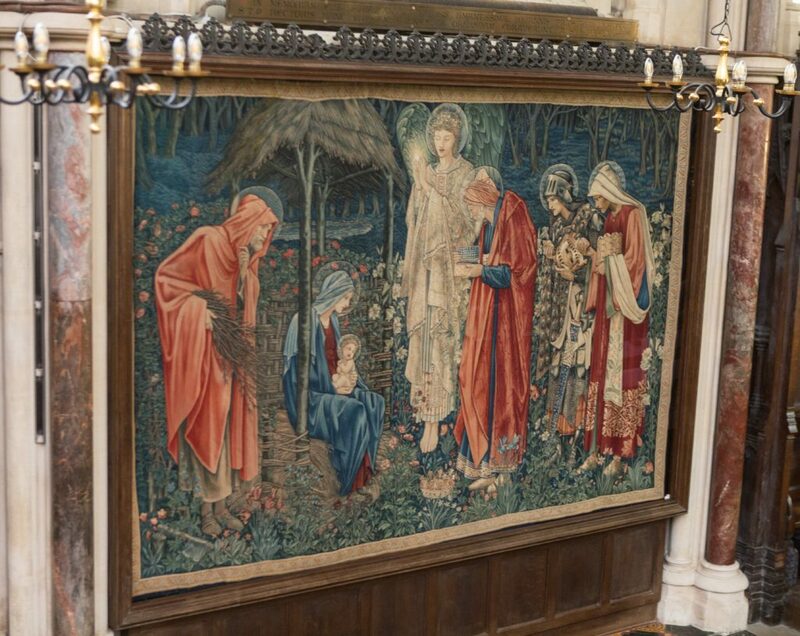 For over six years, the Bursar at Oxford’s Exeter College, William Jensen, had been looking for a practical and affordable solution to re-glaze Adoration of the Magi, a tapestry hanging in their chapel. Challenges included the size of the tapestry (2.4m x 3.6m / 7 ft 10 in x 11 ft 10 in), the limited size of the exterior chapel doors through which the glazing would have to pass, and the existing frame design that was fixed to the wall. Wessex Pictures (Wessex), an authorized Tru Vue distributor in the United Kingdom (UK), was approached to work on the project last fall, and a solution was soon realized. David Palmer, Glazing Consultant at Wessex Pictures, thought it would be a brilliant use of the seamed version of Optium Museum Acrylic®. SmallCorp, based in the United States of America (USA), has developed a method to join multiple sheets of Optium® in seamed panels. Available in sizes up to 3m x 8m (10 ft x 26 ft), seamed Optium provides a glazing solution to protect works larger than the maximum single sheet size – approximately 3m x 1.8m (10 ft x 6 ft). The Adoration of the Magi was commissioned by John Prideaux Lightfoot, former Rector of Exeter College, in the 1880s. According to current Chaplain and Exeter College fellow, Reverend Andrew Allen, its location is opposite to a stall where Rector Lightfoot’s family, his wife and his daughter, sat. “In those days they were the only women permitted to be in college,” explains Rev. Allen. The re-framed “Adoration of the Magi” in situ. Image: Studio8 Ltd. The Exeter College rendition of Adoration of the Magi is significant for many reasons, all of which add to the importance of keeping it in the best condition possible. “This tapestry was the beginning of several of which were copied from it, so a lot of people come to look at [it]. The previous glazing was very dull, it was quite opaque, you couldn’t see the full colors,” says Rev. Allen. Not only important as a work of art, the tapestry also connects current students with Exeter College alumni. “I think it really hits you that these famous, successful, talented people were actually in the same place as you are and found inspiration here . . . that’s really exciting,” says Beatrice Alabaster, B.A. student in English Language and Literature at Exeter College. The project to re-glaze the tapestry was overseen by professional conservators Georgie Dennis of Georgie Dennis Conservation, and Jonathan Tetley of the Tetley Workshop. “The actual tapestry is in fantastic condition, so the main work we were involved in was surface cleaning, to remove loose dirt and particulate soiling, and then to reline it because the lining had been in place for a number of years and was soiled, and needed to be refreshed and replaced,” describes Sarah Howard, ACR, Contract Conservator at Tetley Workshop. Dennis described how the main conservation concerns for the work were light damage and protecting it from the environment, including dust, insects, humidity and temperature. According to Dennis, “The biggest challenge was the size, and finding the right [glazing] material. Glass was too heavy and actually could only be manufactured in one sheet, which was too large to get in [the chapel]”. The glazing for the fixed wall frame measured 3.6m x 2.5m (11 ft 10 in x 8 ft). “When we discussed the re-glazing of the tapestry with College authorities, we came down to two choices. One was to use seamed 6mm [thick] Optium and the other, a single piece of 10mm low reflectance laminated glass. It was really virtually impractical to position that [size] piece of glass into the frame and come through the doors because it would have weighed way over 150 kg (330 lbs. ); we would have had to of used robotic lifts and to get those through the doors would have been extremely problematic,” Palmer explained. “We can obtain exactly the same result by using the Optium, with a lot less weight”. Giulia Bertolotti, International Museum and Conservation Liaison for Tru Vue, adds, “Indeed, compared to glass, [Optium] is roughly half the weight and so it makes the use of the original frame possible”. Several seamed Optium sheets have been used in Europe but prior to this, none in the UK. Tru Vue has been waiting to see where the first seamed sheet in the UK would go. “Because it is the first seamed Optium sheet to be installed in the United Kingdom, and it is also a very special artwork, we are very excited about it,” says Bertolotti. She adds, “We are very grateful that Wessex involved us in this project and made it possible for this seamed Optium sheet to arrive from the United States to Oxford”. To achieve a seam that is as strong and invisible as possible, the sheets are joined at SmallCorp’s facility in the USA. Wessex handled the logistics of ordering, packing, and shipping the joined sheet from the USA, as well as the installation of the sheet in the chapel at Exeter College. “In order to get the sheet to arrive here in good condition . . . we modified [SmallCorp’s] standard packing by using fluted polycarbonate sheeting on both sides of the package because it was a single sheet being shipped by air from Boston into London, and then [transported] to our warehouse,” Palmer explained. Palmer further elaborates: “Getting it up here we made a special A-frame to go on to our truck . . . it was just a question of maneuvering [the acrylic] through the exterior doors of the chapel as they were slightly smaller than the height of the sheet . . . that was a bit of a challenge, but everything worked out very well”. The Optium Museum Acrylic sheet is carefully maneuvered through the exterior doors into the chapel. Using the original frame for the tapestry was important, but posed several challenges. The frame is fixed to the wall of the chapel, and needed to be adapted from its original design, which held 10mm laminated glass, to accommodate the seamed Optium which is 6mm thick. “We [had] to load the glazing from the front, rather than dropping it into frame as we would normally do…So we had to study and then come up with a procedure, which we followed pretty accurately, to ensure that it went into the frame without too much problem,” says Palmer. To deal with the difference in glazing thickness, Wessex manufactured a slip to pack out the frame. Installation of Optium Museum Acrylic into the fixed wall frame. Bertolotti explains how the situation of the tapestry in an active chapel makes glazing an important requirement, “Optium Museum Acrylic will protect the artwork from UV, from dust, from touching and from other types of risks which are associated with the presence of the public, and the use of the space in which the tapestry is displayed. The protection is given without any risk for any component of the artwork to be attracted to the surface of the glazing, because Optium is anti-static”. Now that the conservation and re-glazing are complete, a significant difference can be seen in the tapestry’s appearance. “I think the tapestry is looking really, really fantastic…it is such an obvious change between how it looked before and how it looks now. The colours are so much more vivid, the lines are so much clearer,” praises Alabaster. Close up of the re-framed “Adoration of the Magi” in situ. Image: Studio8 Ltd.
Click here to view a video of the installation. Exeter College warmly encourages anyone who is interested in viewing the tapestry to visit the chapel. Please call +44 (0)1865 279600 to check that the College and the chapel are open before you visit.